Not sure what “Royalty-Free” means or how can you safely use royalty-free music in your project? In this post I am going to introduce you to the royalty-free music concept and to explain in what cases you can safely use royalty-free music in commercial and non-commercial videos, games, and other media projects. According to Wikipedia, Royalty-Free refers to the right to use copyrighted material (music in our case) without the need to pay royalties or license fees for each use or per volume sold, or certain time period of use or sales. How small business owners and freelance video producers can benefit from royalty-free music? If you want to use copyrighted music in a video or broadcast project, in most cases you will need to do two things. First, you will need to secure the permission to use the music, which is commonly achieved by obtaining the sync and master licenses. Then, once your project goes live, you will need to remit royalties (sometimes called the backend) either each time your video is broadcasted or for a specific timeframe. The royalties are collected by the Performance Rights Organizations (PROs) on behalf of musicians and composers and often make for the lion share of composers income. Royalty-Free licensing makes it easier (and much more affordable) by eliminating the backend part. As the name implies, royalty-free license gives you the right to use copyrighted music without the need to pay royalties for recurring use (that is, for each “performance”). For example, if you use royalty-free music as background music for for your company’s video, you don’t have to pay royalties every time someone watches that video on YouTube or on your company’s Web site. If you use royalty-free music in a commercial film, you are not required to pay royalties each time you sell a copy. On a sidenote, most music you hear on TV is not royalty-free. TV networks are required to obtain broadcast licenses and composers and musicians (or their labels and publishers) receive royalties via their PROs. Is Royalty-Free Music Copyright / Rights Free? Absolutely not. Royalty-Free is the licensing option made specifically for copyrighted material. Does Royalty-Free Mean It’s Free To Use? Generally speaking, no, though it’s a common misconception. 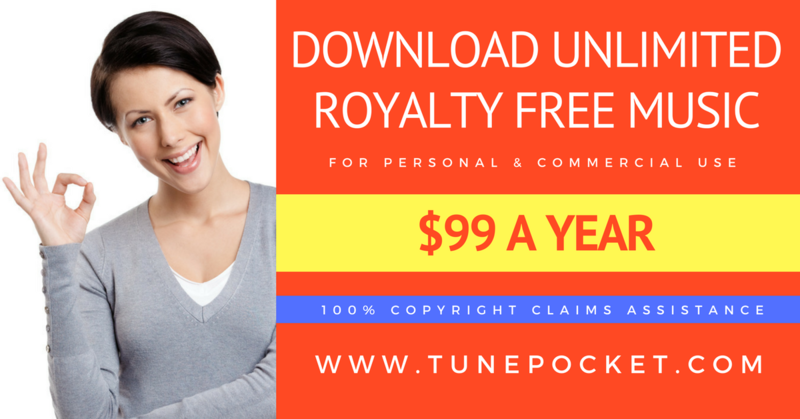 Royalty-free merely refers to the right to use copyrighted music without the need to pay performance royalties. As a matter of fact, in most cases, you do need to pay certain amount of money to obtain that right (that is, to purchase the royalty-free license). Likewise, free music may or may not be royalty-free. Many composers offer their music for free for personal listening or willing to waive the initial sync fees, yet expect royalties if their music gets used in a film or advertisement. Please note that “purchasing royalty-free music” refers strictly to purchasing a license to use the music under the conditions specified in license terms. Royalty Free does NOT mean it’s copyright free or free to use! If you are looking for music for business use it’s best not to assume and to check allowed use and licensing options thoroughly. Can I use the same royalty-free music in different projects? Not necessarily. To recap, royalty free means no need to pay performance royalties for recurring use. The recurring use in this context refers to how many times the end user gets to hear the music in your video or product. For example, if your monetized video gets 1,000,000 views on YouTube or if you sell 1,000 copies of your training video, you don’t have to pay anything extra for the music. But, depending on the particular license, you may need to purchase another one if you want to use the same music in another video. If you intend on using the same music in more than one project, check the licensing agreement to make sure it allows for multi-project use. Can I use royalty-free music in a commercial product? If you are looking for music to complement, for example, a series of training videos that you sell on you Web site, you need to get the royalty-free license that allows commercial use. Please note that, most likely, you will have to pay a higher fee to acquire the commercial license. Many royalty-free marketlaces offer tiered license agreements intended for different use, including commercial. Read the license terms carefully for allowed use. If still not sure ask the copyright holder (in many cases the composer) or, if buying at a royalty-free marketplace, ask support. Here, at MikS Music I offer several types of royalty-free music licenses to accommodate for a range of different needs. A note to YouTube partners. Please note that all my licenses allow for YouTube monetization. If you have questions post a comment! If I purchased a few of your royalty free songs would I be able to use them in a series of videos ( total of eight different videos for the same project)? Yes, you can absolutely use my music in as many videos as you need. Hope this answers your question.